CyberKnife® is a form of radiotherapy treatment known as stereotactic radiotherapy and is also referred to as radio surgery. 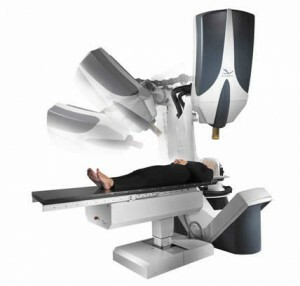 Unlike the name suggests, CyberKnife® is not actually a knife, but is the brand name for the machine which delivers the stereotactic radiotherapy by delivering beams of radiation to any part of the body from any direction, using robotic arms. How does it differ to regular radiotherapy? Like conventional radiotherapy, CyberKnife® delivers high doses of radiation to the tumour. What is different is that many beams of lower doses are used at one time instead of just one large-dose beam. Each of the radiation beams carries a small dose of radiation and, using sophisticated image guidance and computer controlled robotics, the system is able to track the tumour’s position throughout and will respond to patients’ movements and breathing, ensuring only the tumour is targeted. This ensures that the tumour receives the high dose of radiation but surrounding normal tissue will receive significantly lower doses, making it safer for patients. Conventional radiotherapy is usually made up of multiple treatments (known as fractions) and added together, these fractions will give the total radiotherapy dose. It can take up to 6 weeks for all the fractions to be delivered, which will usually involve daily visits to the radiotherapy unit. With CyberKnife® you may only need a few or even a single treatment. For pancreatic cancer, it is very challenging to deliver conventional radiotherapy due to the proximity of other organs (stomach, intestines, duodenum, liver, kidneys and spinal cord) and CyberKnife® could offer a more accurate method of delivering targeted radiotherapy to the tumour with fewer side effects. However, we must stress at this point there has not been any randomised clinical trial data published on the use of CyberKnife® for pancreatic cancer and most of the published research for other cancers has been done by looking at what happened to people treated with CyberKnife®, rather than comparing it with standard treatments. It is important that any new treatment is compared with the standard so we can be sure that it is better than treatments we already have. That said, there is currently a randomised clinical trial (Phase I) in the USA looking at the use of the chemotherapy drug, Gemcitabine along with CyberKnife® radio surgery and we await the results. How do I get CyberKnife treatment? If you wish to access CyberKnife® treatment you will need a referral from either your Consultant or your GP to one of the centres in the UK. Read about a pancreatic cancer patient who has experienced CyberKnife® treatment.